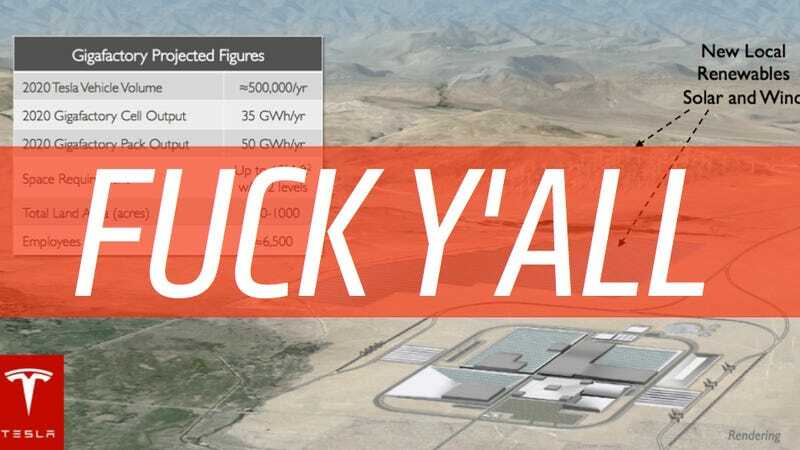 When you really think about it, what state wouldn't want to get Tesla's planned Gigafactory? That's 6,500 high-tech jobs and potential millions of dollars in tax revenue. But the head of the car dealers' lobby in Texas says the Lone Star State shouldn't have to change their laws banning direct car sales to woo Tesla there. On CNBC today, president of the Texas Automobile Dealers Association Bill Wolters said he actually would like to see the factory go up in Texas, citing favorable business conditions there. But he said he doesn't think Texas lawmakers should consider lifting their ban on direct car sales from the manufacturer — namely, Tesla — if that meant increasing their chances of getting the gigafactory. "It is very interesting that a company would come in and say give us your tax abatements, give us our incentives and change the law. You would think they would come to the state based on its own merits," Wolters told CNBC. "Once you start letting the manufacturers sell direct, then all of a sudden the dealers I have in 163 towns of under 15,000 population, they disappear," he said. "All we would have is dealers in the major metropolitan areas with one price controlled by the factories. That is not good for anyone, certainly not 26 million Texans." Emphasis mine because COME ON, BILL. It's unrealistic to think all dealer franchises would die off overnight and immediately get replaced by company-owned stores. They would probably co-exist and provide competition with one another, like they do in other countries. What's the matter, Bill? You afraid of the free market?